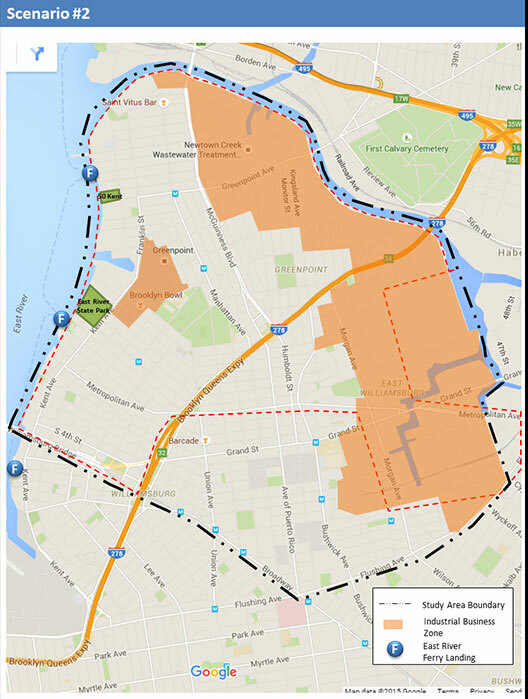 New York City Department of Transportation (DOT) Brooklyn Borough Commissioner Keith Bray and Council Member Stephen Levin today announced that the City will begin a comprehensive study to look at traffic and transportation in the North Williamsburg/Greenpoint neighborhoods of Brooklyn. DOT will use the study to evaluate travel needs for all modes of transportation and traffic congestion in the area. The study will also develop recommendations to mitigate congestion and enhance mobility and safety for all residents, workers, and visitors to the area. The proposed study area is bounded by Newtown Creek to the north and east, Flushing Avenue and Broadway to the south and the East River to the west. This burgeoning area is home to a mix of residential, commercial, and industrial uses. The study will look at demographics, land use and zoning, traffic, pedestrians and cyclists, safety, parking, public transportation, and movement of goods/trucks in the area. The study will collect data on traffic, turning and pedestrian counts at major corridors and intersections throughout the study area. The study will be coordinated with the Department of City Planning, which is preparing the North Brooklyn Industry and Innovation Plan. As part of public outreach, DOT has established a Technical Advisory Committee (TAC) that includes local elected officials, Community Board 1, Department of City Planning (DCP), New York State Department of Transportation (NYSDOT), New York City Transit (NYCT), Metropolitan Transportation Authority (MTA), and New York Metropolitan Transportation Council (NYMTC). Local community members will also be able to participate through a minimum of three public meetings, which will be held corresponding to study milestones. "North Brooklyn, particularly Williamsburg, has undergone significant changes, and it's important our streets and transportation keep up," said State Senator Daniel Squadron. "I thank the Department of Transportation and Councilmember Levin, and look forward to continuing to work towards better streets and transportation in our communities." Data collection will last through Spring/Summer 2016 with final results and recommendations to be released by the Fall 2017.